Aquatic pond plants not only add beauty and color to backyard ponds and ornamental water gardens but are responsible for supplying valuable oxygen for aquatic pond life, including koi, goldfish, toads, snails etc. Pond plants provide shade from the midday sun for fish and other pond life and provide natural filtration, which helps to keep your pond water clean. 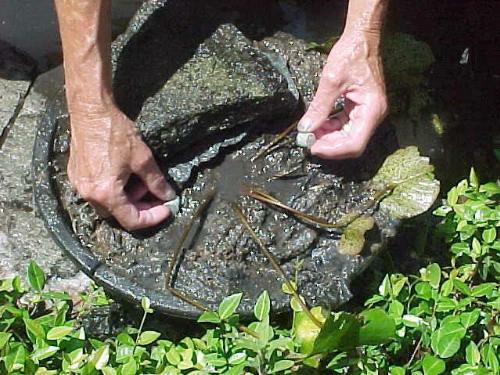 In fact many pond keepers utilize pond plants for biological filtration (bog filter). If maintained correctly peat bog filters will control the levels of toxic ammonia, nitrites and nitrates. Like any living organism pond plants require food, in order to grow and flourish. Many garden ponds lack essential nutrients that pond plants needs for lush growth and flowering. The soils used to grow aquatic plants are frequently low in essential nutrients. The micro nutrients found in pond plant food and aquatic plant fertilizers will help to develop lush foliage, encourage beautiful blooms and speed up growth and development. Water lilies will particularly benefit from waterlily fertilizer tablets or water lily liquid plant food. Aquatic plants, just like terrestial plants, require nutrients to promote healthy growth and flower/seed production. Many water gardens & pond are over stocked with fish so extra fertilization is not necessary. But, if your fish levels are low to medium, there might not be enough nutrients available for optimal growth & health of your plants. That is where supplimental feeding is important. Many kinds of aquatic plants require additional fertilizer to keep blooming through out the season. TJB-INC carries several different brands of Plant Fertilizer for you to choose from. 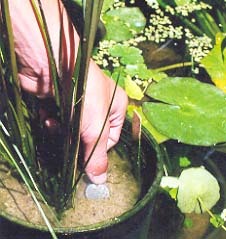 Pictures below illustrate how to insert fertilizer tablets into a root ball of an aquatic plant. 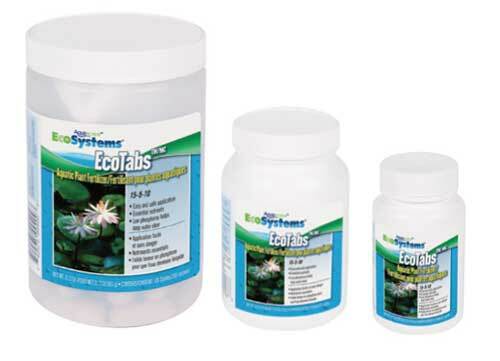 EcoTabs Feed your aquatic plants Aquascape EcoTabs 15-5-10 Plant Food to maximize beauty and get the most out of your investment.